Traditional Estonian pickled gherkins are made in a large wooden barrel. Cucumbers are placed between layers of blackcurrant leaves, dill stalks and slices of horseradish. Chilled water, containing 4 - 6% salt is poured over the cucumbers, and then a weight is placed on them. The barrel is then taken into a cool cellar with even temperature, where bacteria will produce lactic acid, which will ferment the cucumbers. In about 30 days, the cucumbers acquire a pleasant, distinctly sour taste. Those who do not possess a cellar have devised new methods of pickling cucumbers in modern apartment buildings. Soak the cucumbers in cold water for 24 hours, wash with a brush and rinse. 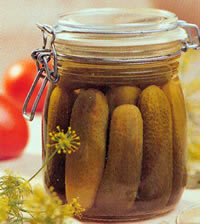 Put the gherkins in a large jar, add dill stalks, currant leaves and sliced garlic. Bring the water with salt and sugar to the boil, allow it to cool until it is lukewarm, and then pour it over the gherkins. Cover the jar with a saucer and leave to stand. In two - three days the liquid will turn cloudy, as the fermenting process caused by lactic acid, and speeded up by vinegar, will start. When the cucumbers have turned more sour (in 2-3 days), strain the salty liquid into a saucepan and throw away the stalks, leaves and garlic. Bring the liquid to the boil, and boil for 2-3 minutes to kill the bacteria. Wash the cucumbers under running water, and then pour boiling water (this is a 'new' boiling water) over them. Put them in jars which have previously been sterilized with boiling water or in a hot oven. Pour the hot salty liquid (this is the 'old' salt water which was boiled to kill the bacteria) over them and seal the jars immediately. Pickled gherkins will keep in a dark cupboard at room temperature for up to two years.